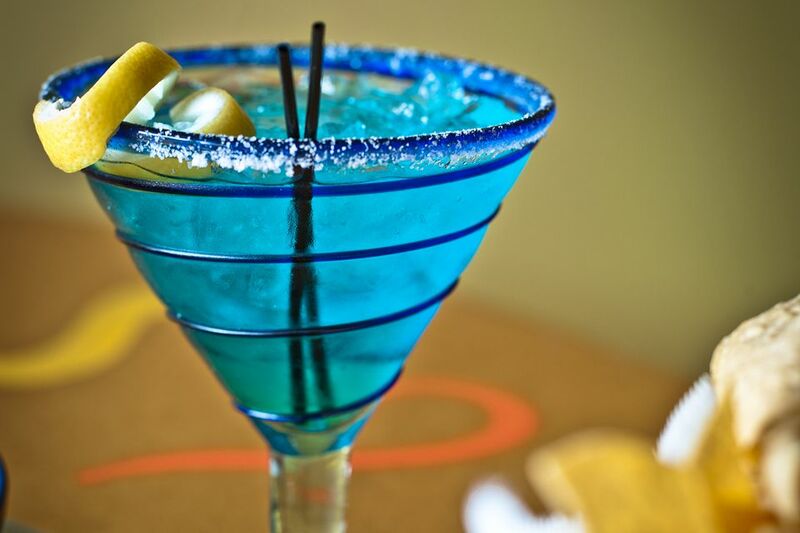 The Catalina Margarita is a very fun fruity margarita. There's a lot to love about this recipe: The beautiful blue color is captivating, there's tequila (of course! ), and it has a delicious peach-orange flavor that's hard to resist. Best of all, it's incredibly easy to mix up! This margarita requires just four ingredients, all of which are very common, so you might already have them stocked in your bar. The blue curaçao not only gives the drink its captivating color, but it also adds a hint of orange that's spectacular against the peach schnapps and lemon-lime flavor of sour mix. It's perfect for summer parties and could even brighten up your mood on a chilly winter day! In a cocktail shaker filled with ice, pour the tequila, peach schnapps, blue curaçao, and sour mix. Blanco tequila is a great choice for this margarita. Since the drink doesn't have strong flavors, it's best to choose one that you enjoy drinking straight. There's no need to spend a lot of money, but a good mid-range tequila will shine in this mix. It's definitely worth your time to make fresh sour mix, especially if you mix up margaritas regularly. Essentially, it's just a lemon-lime syrup, so all you really have to do is add the two fruit juices to a batch of simple syrup. You'll find that it's much cheaper to make at home than buy at the store. That's money you can put towards the tequila! Alternatively, you can use 1/4 ounce of simple syrup and 1/4 ounce of either lemon or lime juice as a substitute for the sour mix. This margarita is equally impressive when served as a frozen cocktail. Simply combine the ingredients with 1 cup of ice in a blender and mix until it's nice and smooth. If you skip this recipe's peach schnapps and use lime juice instead of sour mix, you will have a blue margarita. How Strong Is a Catalina Margarita? Tequila is generally bottled at 80 proof and blue curaçao at 30 proof. It's the peach schnapps that will have a larger impact on the Catalina Margarita's alcohol content because it ranges from 30 proof to 90 proof. On the lower end of that spectrum, the cocktail shakes up to 25 percent ABV (50 proof). That's not considered a light cocktail and with a 90-proof schnapps, it can reach 34 proof (68 proof). Don't let the sweet taste trick you into drinking one too many or you will feel the effects in the morning!